We are currently working on the top basketball drill site on the web. We are constantly adding new basketball drills and practice ideas. Below you will find some of our basketball exercises that may be used to help players develop basketball technique and tactics. Please keep checking back for more top basketball drills, practice ideas, and workouts. 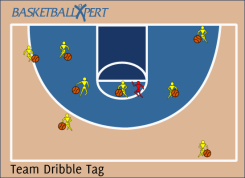 Our basketball drills are fun games that are proven to provide the best training for the fastest basketball skill development. Our basketball drills give you step-by-step easy to follow setup and instructions. Our variations of each drill allow you to tweak drills to focus on perfecting a particular skill set. We wrap it all up with detailed coaching points to make sure you are getting the most of your practice sessions.